SG-1 awakens in a mysterious facility on P3R-118 with no memory of their former lives. A memory stamp procedure has given them new identities. No longer O'Neill, Carter, Daniel, and Teal'c, they are now Jona, Therra, Carlin, and Tor. Unaware of the prosperous domed city above them on the surface, they are doomed to live a dreary existence as workers within a massive underground complex providing energy for a planet in the midst of an ice age. At the SGC, General Hammond attempts to solve the mystery of his team's disappearance. He refuses to accept the possibility that they could have perished on the planet's icy surface, but repeated rescue missions turn up no sign of SG-1. On the planet, it is Administrator Calder who is determined to prevent a rescue. Outraged by SG-1's criticism of the slave labor used on the planet, it is his intent to entrap the team in the very system they condemned. Brenna, the supervisor of the workers, questions his decision, but she is powerless to help on her own. The memory stamp is not permanent, and slowly SG-1 begins to experience vague and fleeting glimpses of memories hidden just beneath the surface, memories that convince them that they don't belong there. As their work within the underground facility earns them Brenna's respect, the fleeting glimpses become more pronounced, and the gradual recall of their identities begins to threaten Calder's plans. Brenna offers them a means of escape, and in overthrowing Calder, SG-1 reveals the surface city to the workers below, offering them freedom from their harsh existence. The domed city has no crime, and no unemployment. The planet is advanced in metallurgical and chemical technologies, and proposed trade with Earth in exchange for stargate technology and gate addresses. Workers are given a new personality through a memory stamp, ensuring compliance. Nightsickness is the term given to the failure of the memory stamp as the memory returns. 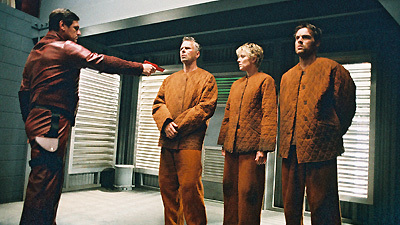 The personalities given to SG-1 were Jona (Jack), Therra (Carter), Carlin (Daniel), and Tor (Teal'c). Major Griff and SG-2 were sent as search and rescue to recover SG-1. Teal'c must perform kelno'reem every day. There's a man... He's bald and wears a short-sleeved shirt, and somehow he's very important to me. I think his name is Homer.